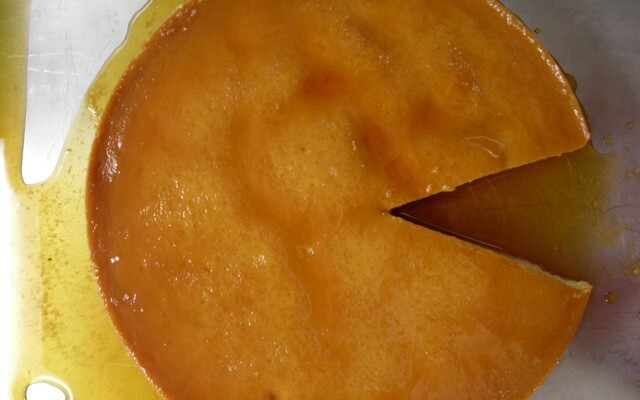 I love flan – or crème caramel in French. And it’s not as hard to make as you might think. Try this easy recipe to get you started. You may have to try it several times to make sure you’ve got it right… to really get the best one you will need to taste test. Preferably a lot. I also really love the flavor makeover that flan has been getting; I’ve seen strawberry, pumpkin, guava, even flan made with basil. The lightest, airiest best-flavor flan I’ve had this summer was a coconut flan, also lighter in calories/fat – so I can eat more. These flavor twists on the classic are sure to wrench the sensibilities of any Purist – and it’s true that a classic real flan is delicious, distinguished, creamy and flawless. And probably the best. But I could become obsessed with a strawberry balsamic basil flan (I’ve already become obsessed with this flavor combination since trying Barbrix‘s strawberry balsamic basil Prosecco summer cocktail). In fact, I can think of a lot of summer cocktails that would make a really good flan: margarita (even a spicy one! ), piña colada, mojito, bellini… the list could go on and on. And they will all need to be taste-tested and perfected. Preferably by me.